I didn't even realize Memorial Day was approaching until this past weekend. As I try to play catch up, 2008 is whizzing by and I keep piling more on my plate. Granted, I've been dragging my feet on several things, so it makes the to-do list ever so much more daunting. I do it to myself. In the meantime, 75% of my pets are being neurotic and E is working hard, and hardly sleeping, to finish a film with our neighbor in time for a submission deadline this weekend. We still haven't unpacked from our trip last weekend, which I haven't gotten around to writing about. Maybe I will after I say something about my Maker Faire experience. I'm also in the process of uploading a ton of photos starting from the end of last month. 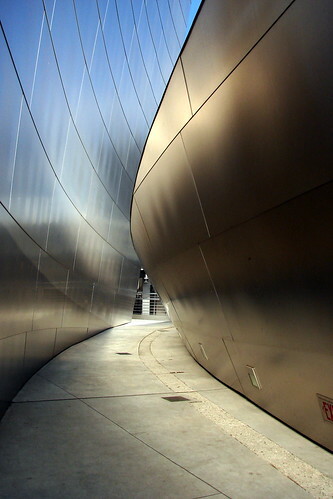 Here's one from the private photo tour we took with the Stereo Club of Southern California at The Walt Disney Concert Hall. love reading your blogs. Makes me feel connected. That photo is so cool! What a wonderful photo; I think you have a second career brewing here. Great shot! Isn't 2008 whizzing by though ... everyone I know is just so busy. It seems to stretch around the world too!